Tag Archives for " Scott Thomas "
1	Marketing Automation: What is it and Why Should I Care? It’s guest post day here at Duct Tape Marketing and today’s guest post is from Scott Thomas– Enjoy! Marketers, meet your secret weapon: marketing automation. Only recently, has this underutilized method of demand generation been brought to the forefront of public attention. Marketing automation has slowly become a go-to buzzword in the marketing world but what does it really mean and more importantly, how can it help your business? For starters, marketing automation refers to technology that allows marketing departments and organizations to more effectively market on multiple online channels (such as email, social media, websites, etc.) and automate repetitive tasks. In its most ideal state, marketing automation provides you with a platform to efficiently deliver engaging content that turns prospects into customers and then follow up with personalized messaging that keeps those customers coming back. Marketing automation means two huge things for marketers: conversion and attribution. First we’ll look at its success converting leads. 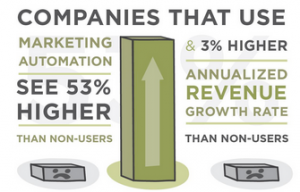 According to a study by The Aberdeen Group, companies that use marketing automation see 53% higher conversion rates than non-users, and an annualized revenue growth rate 3.1% higher than non-users of marketing automation platforms. Content Marketing: Today’s consumers don’t respond to conventional “Mad Men” style marketing and advertising tactics; instead, they respond to engaging, informative content that speaks to them and not at them. By distributing content that engages your audience, you’re not only satiating their appetite for information, but you’re also working towards the end result of creating a connection with these potential buyers and ideally, driving them closer to a sale. Lead Nurturing: This process of educating and staying fresh on the minds of prospects who aren’t yet ready to buy allows you to turn otherwise cold leads into added revenue. Lead nurturing can take many forms, from personalized, Happy Birthday emails to reengagement campaigns. The possibilities for customizing your marketing automation pipeline are limited only by your organization’s capacity to do so and while it may take some heavy legwork to initially set up, don’t be intimidated. Marketing automation can save you time and money while converting more leads by simply utilizing the programs you already have in place. 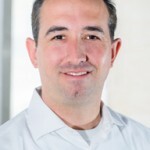 Scott Thomas is the founder and president of the Intelechy Group, an Austin-based revenue growth agency. Scott has spent more than two decades driving highly profitable revenue for industry leaders such as AT&T, Dell, AMD and SAP. Intelechy Group specializes in Go-to-Market (GTM) Strategy & Development, Brand & Market Positioning, Demand Generation and an array of marketing services that propel organizations to become revenue and profit leaders in their marketplaces.